Practicing yoga with your kids allows you to model healthy lifestyle habits, inspiring them to cultivate a mind-body connection all while having fun. Kids love to imitate things and many yoga poses embody the beauty of real life overflowing throughout all of nature. Try taking your yoga outdoors, to the park or even in your own backyard so you can literally salute the sun, stand next to or climb a tree during Vrksasana, and soar with the birds in some high-flying partner poses, which most kids love! Below, I have outlined some of the fun yoga games and adventures I share with my son. Each of the four parts begins with an interesting fact and evolves into a short (but focused) mommy and son yoga session (that works just as well for daddies too)! When teaching and practicing with children, remember the triple "S" rule: make sure the sequence is Short, Simple and makes them Smile. I hope you can create some lasting memories with your yogi sprouts too with these ideas! The sun offers light and warmth to the earth, supporting the lives of all the plants, animals and flowers—giving us all the energy we need to survive. It makes sense that in many yoga practices, we begin by honoring this powerful force. Fun Fact About The Sun: It takes eight whole minutes for light to travel from the sun to the earth. Greeting the sun at the start of your yoga flow warms up cold muscles, which prevents injuries and helps to invigorate the body. Emphasize staying present by moving WITH the breath and not rushing through the motions. Set a timer for eight minutes and count how many Sun Salutations you can complete. Through breath and movement, yoga helps us discern between standing our ground and stretching beyond limits to compromise and play nice with others. Similar to yoga, trees represent both strength and flexibility as symbolized by their solid trunks and the sometimes flimsy looking branches bending in the wind. Fun Fact About Trees: The Quaking Aspen, a tree colony considered as one giant organism, has a tremendous root system that’s over 80,000 years old and counting, making this the oldest living thing on Earth! Try counting to 10 while standing in Tree Pose without falling over. No problem? Now try counting all the way to 80,000! Yoga teaches us to seek liberation from the pain and struggle of the human condition not through stifling or avoidance, but through awareness and ultimately, transcendence. Birds of all shapes and sizes remind us that freedom exists and inspire us to take flight and release that which weighs us down. Fun Fact About Birds: Hummingbirds can fly backwards, upside down, and hover in space! Choreograph a high-flying, bird-like sequence, helping your little one build trust and see the world from a bird's eye view! Rest rejuvenates the body and refreshes the mind. Observing stillness during the final moments of an active practice promotes healing and encourages healthy transformation of past beliefs and outdated stories that no longer serve us. During the quiet moments, we can observe the shifts as they occur. Fun Fact About Naps: Bats sleep upside down for some sleepy hang time, spiders tuck in their legs to snooze, and dolphins catch some shut-eye with one eye open to keep watch for predators! Before settling in for a nature rest, learn about some of the strange and unique sleeping habits of insects and animals, and then take a spider's Savasana! Little yogis and yoginis do not always have the the interest nor the attention span to endure a full yoga session, but will look forward to a fun yoga play date that will inspire them in years to come to follow in your yoga footsteps. This will also encourage you to invite your inner child and playful spirit onto your mat! 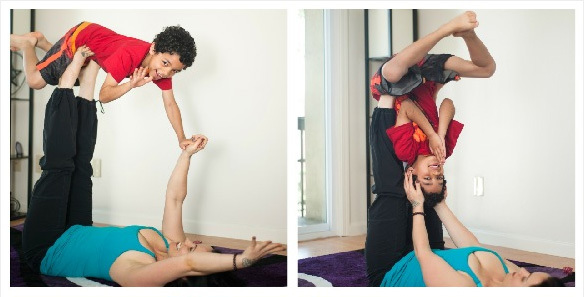 Do you have any other yoga games that have helped you make your yoga family-friendly? Please share your creativity below!